At RHRLI, we’ve been telling you why we feel we have the most effective treatment for patients looking for a permanent solution to hair loss or thinning hair. It’s called the ARTAS® Robotic Hair Transplant System and it uses state of the art technology to give you the most natural looking, healthy hair you can find. We’re the only hair treatment center on Long Island that has the ARTAS® System and while we’ve known for a long time how accurate it is, we now have a scientific study that shows this new technology is making it even more accurate. RHRLI wants to let you know about this research which gives us additional data on the effectiveness of our robotic procedure so you can understand why we feel this is the best option for many of our patients. Before we look at the peer-reviewed research, which appeared in the June 2016 issue of the journal Dermatologic Surgery, we want to give you the basics of the ARTAS® System. If you’ve been searching for a treatment for hair loss, you may have heard of various procedures that go by initials like FUT and FUE. FUT stands for Follicular Unit Transplantation. This is an often painful surgical procedure, typically referred to as “strip surgery,” in which hair follicles are harvested from strips of skin. FUE stands for Follicular Unit Extraction. This is a much less painful, minimally invasive procedure in which hair follicular units are harvested individually from the back and side of the head. Unlike FUT there is no linear surgical incisions and recovery is quicker. The ARTAS® System is a Robotic Follicular Unit Extraction (RFUE) procedure. Unlike other FUE procedures where doctors use a hand-held device to harvest donor hairs, the ARTAS® uses a robotic arm to select hairs in a way that will preserve the natural appearance of the donor area. 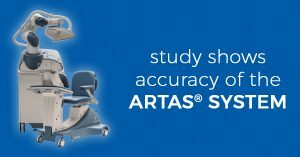 The journal research focused on the accuracy of ARTAS® and how it’s improved over time. The ARTAS® System has been in use since 2011. Since that time, the procedure has become a popular alternative to transplants using a hand-held device. In 2015, new technology was introduced called advanced graft selection capability. In earlier versions of ARTAS®, the robot randomly selected follicular units for transplant. The new technology allows your surgeon to program the robot to only harvest larger follicular units. The researchers studied 24 patients and the difference between those who underwent the procedure with random harvesting as opposed to those who had transplants with advanced graft selection was significant. Those who received the more advanced treatment received 17 percent more hairs per harvest attempt and 11.4 percent more hairs per graft than those treated with the older technology. The results show that the most accurate treatment available for hair loss treatment is becoming even more accurate. RHRLI now has this newly advanced graft selection capability, so we continue to have the most effective hair loss treatment available on Long Island. For more information, contact RHRLI today.